As I mentioned last week, blush and white is one of my favorite color combos for the spring/summer season. It’s so feminine, romantic and elegant don’t you think? I especially love this Topshop top paired with my must-have white skinnies. The top features a subtle satin shine that elevates the whole look for nighttime wear. Featuring my go-to off-the-shoulder silhouette and stylish tied cuffs, it’s a gorgeous piece for drinks and dinner! 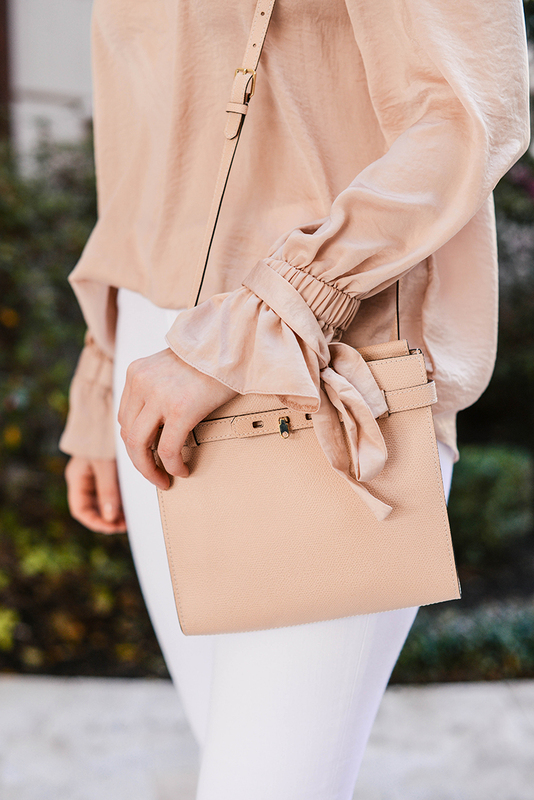 Unfortunately my top is now sold out in blush, but I found this one that is nearly identical and on sale for under $30! This ruffle crop jacket is a chic style for the office and comes in three colors! This striped wrap dress is a pretty daytime style for the weekend and travel this spring/summer. Try the mule trend with these knotted bow slides. So cute! I’m not sure I could pull this look off, but I sort of love these tassel-adorned jeans. This mutton sleeve white shirt is another gorgeous statement staple to add to your wardrobe. You can never have too many white tops! Love this combo as well, this is such a cute look. Loving this perfect spring look! Blush is my favorite color. It looks so pretty on you! Loving this soft and feminine neutral look! That top is so pretty! I agree that Topshop has such cute stuff this season. I was just in Nordstrom yesterday and I was coveting so many pieces! You look lovely in blush, friend! You are gorgeous in blush, Merritt! Ummm could you be any more gorgeous?! Love this combo so much! What a beautiful look! I also adore this look and love browsing the Topshop arrivals.